Example 107 N. Main St. The Gothic Revival Style was inspired by the cathedrals & churches of Europe. The style became popular thanks to designer, Alexander Jackson Davis, and his disciple Andrew Jackson Downing, landscape architect [who popularized Davis' plans through his books]. The two believed that the classical Greek Revival buildings which covered the American landscape were too rigid and reflected an anti-Christian sentiment. Influenced by an interest in the romance of medieval Europe, Davis & Downing sought a return to Christian principles & building prototypes which exuded picturesque details. Gothic cathedrals had great vertical emphasis, reaching to Heaven, so revival buildings had steeply pitched roofs. Windows were tall & slender. Arches were not round but pointed for windows & window hoods. Details were added to produce picturesque effects. Oriel, lancet, & bay windows, with leaded &/or stained glass; towers; clustered columns; pierced bargeboards under deep eaves; and trefoils & quatrefoils were employed. The Eastern examples of the Gothic style, as with those of the Greek Revival style, were often masonry. The style spread west with the help of readily available carpenter's pattern books. 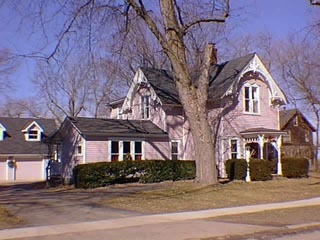 Examples in the Midwest were most often clapboard interpretations of the style having more in common with the Carpenter Gothic style. While the Gothic style was seen as a reaction to the inhumanity of the Industrial Revolution, the Carpenter Gothic style which subsequently became popular, derived its name from sawn details made possible by the new tools, the scrollsaw & lathe made possible by machines. Characteristics of the style remained the verticality & emphasis on the picturesque integral to the earlier incarnation, while the sawn details of the bargeboards, window hoods, & porches could be anything a carpenter could produce with his scrollsaw. This led to vernacular elements, i.e. those peculiar to a local area. Steamboat Gothic was the name, meant to be disparaging, given to the most excessive, flamboyant examples built. Davis & Downing saw the Gothic Revival style as a return to a more natural architecture & recommended paint colors which would blend with the landscape. Earth colors- browns, tans, golds, ochres, buffs & greens, those found in the natural surroundings, were favored.